United States, or Uncle Sam?? During the War of 1812, Sam Wilson (Marvel’s Falcon was aptly named), a meat packer in Troy, New York delivered meat for the soldiers fighting the battles of the war. There was a directive from the government that all supplies sent to the troops be stamped with the name and location of the supplier. He stamped the barrels with a U.S. which actually stood for United States. Sam was locally called Uncle Sam; when the barrels were delivered to the troops, soldiers from Troy knew Sam Wilson and called him Uncle Sam to other soldiers. Word spread and hearing the story, more and more soldiers began saying that the meat came from “Uncle Sam.” The soldiers began calling themselves Uncle Sam’s soldiers. By the end of the War of 1812, Uncle Sam was considered a new nickname for the United States. So now we know how the name Uncle Sam became associated with our armed forces. But what about the picture? We have to go back earlier than you might think. Thomas Nast was the first artist to create a picture of Uncle Sam. He’s the same artist who made Santa Claus into the character we see today. He created his image in the 1870s and 80s, and then continued to refine the image; he was the first artists to give Sam a white goatee, top hat and a suit of stars and stripes. J. M. Flagg’s 1917 poster was based on the original British Lord Kitchener poster of three years earlier. It was used to recruit soldiers for both World War I and World War II. Flagg used a modified version of his own face for Uncle Sam, and veteran Walter Botts provided the pose. Now…, to find the message. He remembered seeing a poster of Lord Kitchener, the British Secretary of War, asking the British to “Join Your Country’s Army – Lord Kitchener Wants YOU.” Inspiration! He created the poster with the soon to be iconic image of Uncle Sam with the caption Uncle Sam Wants You To Join the Army. It was this image more than any other that set the appearance of Uncle Sam as the elderly man with white hair and a goatee wearing a white top hat with white stars on a blue band, a blue tail coat and red and white striped trousers, and his pointing finger. Flagg’s Uncle Sam first appearance is generally believed to be on the cover of the magazine Leslie’s Weekly, on July 6, 1916. Also on the cover was the title “What Are You Doing For Preparedness.” A poster of the image was also created, using the now famous phrase I wan You for the US Army. More than four million copies of this cover image were printed between 1917 and 1918. When Flagg was asked to update his famous image, he hired Indianan veteran Walter Botts as a model. Family lore has it that he was chosen because he had long arms, a long nose and extremely bushy eyebrows. The Technology Age is upon us, ladies and gents! Anything you could ever desire is at your fingertips, rendering third parties nearly obsolete when it comes to food delivery (Seamless, Uber Eats) and retail shopping (Amazon, StitchFix). Now it’s extended into the wonderful world of publishing! ePubs and PDFs are part of our everyday vernacular, and self-publishing has become a rather commonplace alternative. You can see the draw: who needs to find a rare (and potentially expensive) agent at a major publishing house? Who needs to have a 1,000 pound printing press stowed away in their basement? Why, nobody at all! 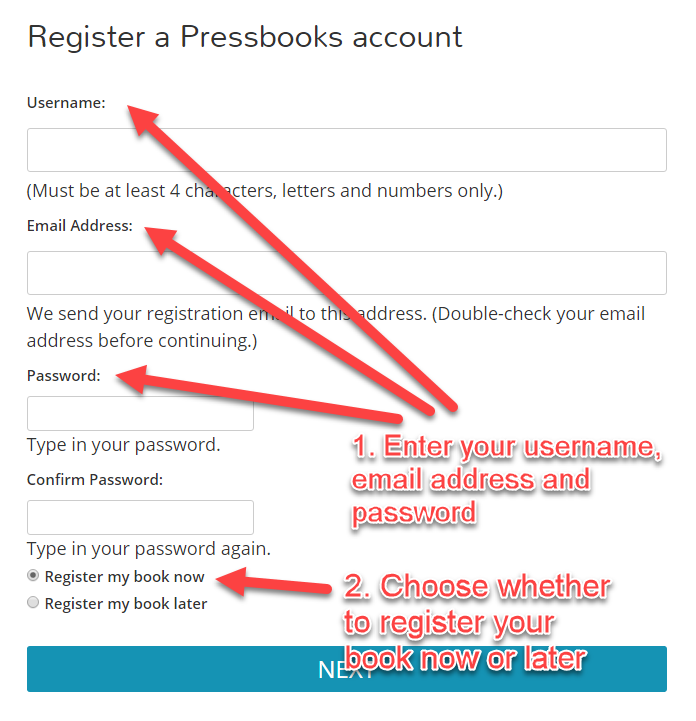 In fact, being a member of our library gives you access to online software that allows you to publish your own book(s)! Pressbooks allows you to create professional-quality EBook and print-ready files of your book in ePub, MOBI, and PDF formats. You can write and edit your books without any worry of coding or graphic design: neither is required here. Pressbooks has several themes and formats to choose from, but it won’t take any ownership over your newly minted masterpiece! Already started writing your book? They’ve got you covered there, too! You can copy and paste each chapter into the Pressbooks format or you can upload your entire document from Microsoft Word. Now that you’ve knocked out the basics, it’s time to get down to business! You’ll be prompted to add your book information: title, pub date, cover, etc. Most of these data entry spaces are optional, so keep that in mind if you’re still unsure on the details of the book. 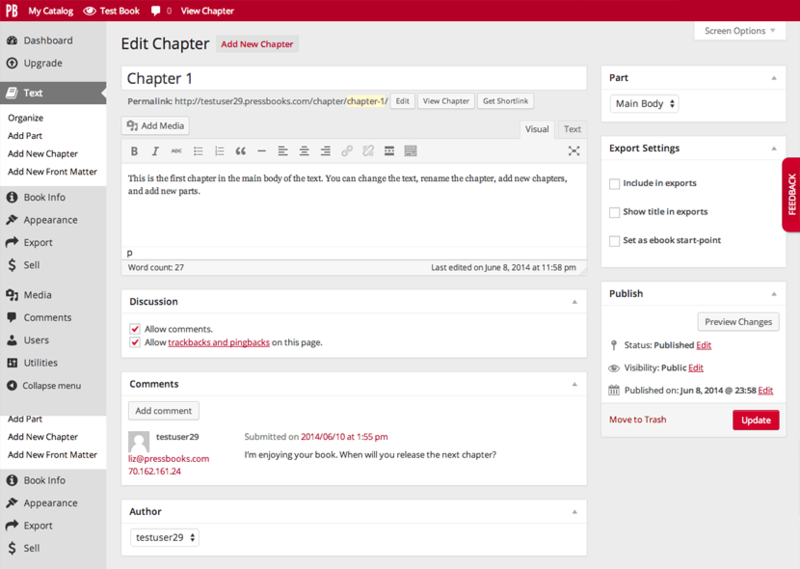 The main BiblioBoard page allows you to edit data, organize chapters (Main Body), and create a preface (Front Matter) or bibliography (Back Matter), etc. This same page gives you the ability to choose from twenty themes to make your book aesthetically pleasing and uniquely you! When all is complete, every “I” dotted and every “T” crossed, you can export your latest work. Worried this may be difficult? Fear not, the export process involves one button! Can you guess what that button reads? Yep, “Export”…tough stuff, I tell you!